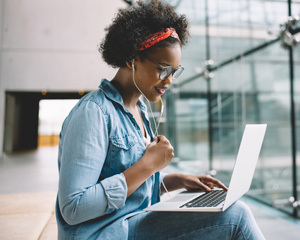 In a recent survey, most chief academic officers (CAOs) at 359 two- and four-year institutions (86 percent) agreed that digital content and learning can improve the student experience. Eighty-seven percent of CAOs said digital learning resources "make learning more efficient and effective for students"; and 74 percent agreed that digital content would provide a richer and more personalized learning experience over print resources. However, a big hold-up to going "all digital" is a lack of student access to devices. The survey was undertaken by the Campus Computing Project for the Association of Chief Academic Officers and shared at OLC Accelerate, the Online Learning Consortium (OLC) conference taking place this week in Orlando. OLC is a member community that helps schools, faculty and staff produce higher quality digital teaching and learning. The Campus Computing Project is an annual survey of campus CIOs that examines the use of IT in higher education. CAO participants filled out an online survey this fall. As "Provosts, Pedagogy and Digital Learning" reported, the IT portfolio for CAOs varies from one school to the next. Most, 89 percent, have oversight of libraries; 82 percent oversee online degree programs; at 75 percent of institutions the campus center for teaching and learning reports to the CAO; and two-thirds of registrar and institutional research and analytics offices do so (61 percent and 60 percent, respectively). Transitioning to the use of more digital resources in undergraduate courses (52 percent). The allure of adaptive learning is a particular draw among this segment of administration: Ninety-two percent thought adaptive learning technology shows "great potential" for improving learning outcomes, and 87 percent said they'd like faculty at their schools to make greater use of it. However, this same crowd has given a thumbs-down to many existing campus IT investments. While library resources and services were rated positively by 53 percent of CAOs, only 40 percent rated the same for online courses and programs; 37 percent for on-campus teaching and instruction; and 36 percent for academic support services. Besides a lack of student access to computing technology, another obstacle holding up digital learning initiatives is that so many institutions lack a campus plan for "going digital," said Kenneth C. Green, head of the Campus Computing Project and author of the survey. The survey found that two in five schools haven't developed an institutional plan, and the count is even higher for public universities specifically — closer to 51 percent. "There are a lot of these technology initiatives — certainly the use of digital learning — that are highly decentralized. They aren’t monitored from the CAO office. These are often departmental initiatives, or you have groups of individual faculty members," said Green. A big question becomes, "where's the map and who's doing the mapping? It's not any one person. These are large collaborative initiatives from different groups. It involves IT. It involves individual departments and units. It involves the office of the provost. Sometimes the provost may be directly involved. Sometimes it may be a deputy provost for whom this is the designated responsibility." The plan must also encompass more than online initiatives, Green emphasized. "The artificial chasm that has separated the use of technology and digital resources between on campus and online initiatives is just a false line of demarcation," he asserted. "The conversation should not be about one or the other but on how does technology help us do better in all environments? These are points on the continuum — and to create these artificial and arbitrary boundaries between online and on-campus just doesn't make any sense." The survey and report were underwritten in part by a grant from the Bill & Melinda Gates Foundation. The results are openly available on the ACAO website. Green said that a "narrative" version of the results would be published on the same site in December.